Working seven sides, Bighorn Logging Corp. focuses on getting the greatest value from every tree. The interior of the doug fir office is spacious and well-lit. Wildlife prints and hunting trophies line the walls. Obviously someone at Bighorn Logging Corporation in Banks, Ore., loves hunting and the outdoors. That someone would be Harve Dethlefs, who will take the time to tell the story of the mountain caribou... or the whitetail deer... or the pheasants and mallards in the Willamette Valley. "Sure, I'm a contract logger," grins Dethlefs, "but part of that is because I love being outdoors, seeing wild game, where every day's a potential picnic." When Harve discusses his love for logging, however, you don't get the idea of a picnic. He's a detail-oriented, highly organized businessman who can focus tightly on his employee safety standards, the timeline for a current cut, the condition of the forest floor for replanting trees, and his preference for the Waratah dangle head processors when many of his fellow loggers want stroke delimbers. Harve's grandfather homesteaded in this area about an hour south and west of Portland. His own father was a logger south of Banks. But when Harve graduated from high school, he attended a year of college and then volunteered for the draft. When he came back, he worked for a while in a local sawmill, but in the early '60s, the old growth was pretty much gone and the forest industry seemed shaky. He drove truck for a chemical outfit and then worked his way up to warehouse manager for Tektronix. He gathered useful experience with projects like an automated storage and equipment retrieval system. But after 20 years, at the age of 43, he decided he wanted to get back in some way to the woods. Harve is currently working for Longview Fibre, for Forest Systems, for Willamette Industries, for Stimson, and for Olympic Resource Management, who manages timber for Hancock Timber Resources Group. But Harve identifies strongly with the smaller guys who make the big operations run. "This valley used to be full of mom-and-pop sawmills," he says, "but even with recent changes, I think small industry is still the backbone of this economic system." 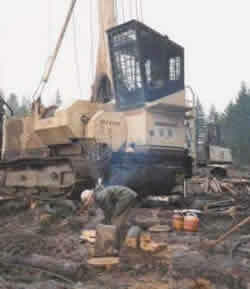 Currently, Dethlefs' Bighorn Logging is operating five yarder sides and two ground sides. Equipment includes two 70-foot Thunderbird towers - a Thunderbird 355 and a Thunderbird 6250 swing yarder for cable logging in steeper terrain. The other yarder is a T-23 Berger. He does some ground logging with a shovel in areas adjacent to towers. In the summer, Bruce Herb and Steve Sohler run a roadbuilding side, with Harve's brother Doug running a grader. In the winter, these roadbuilding employees are absorbed into other sides. The payroll includes about 70 employees on the sides, plus three very efficient gals who run the office. Denise Dethlefs, Harve's daughter, is the secretary- treasurer; Maggie Brower handles payroll and accounts payable; and Lory Puntenney is the administrative assistant. We went out to check the side working at what Harve calls the Carp Head Unit, southwest of Forest Grove. It's a 66-acre unit, part of a 7000-acre tract owned by Willamette Industries. The contract calls for a fall-buck-yardload operation, with hauling done through Willamette Industries. It's pretty much uniform 55-year-old Douglas fir with an average 16-inch dbh. There are some alder, cedar and hemlock, but when the area is replanted, it will be mostly doug fir replacements. In nearby areas you can already see the young seedlings, protected from hungry deer by a blue sleeve. It is here that Harve proudly displays the three-year-old 70-foot Thunderbird yarder (TTY6170) tower with Boman sky car (motorized carriage) and skyline system. He likes the Kobelco 300 series log loader, and the 24-inch Waratah harvester/processor head on a 300 series Kobelco (both with Jewell front), processes an amazing number of stems - 600 to 800 pieces a day. Harve bought four of the Waratah heads in a two-year period: "We liked the heads; they've been good to us in regards to maintenance, downtime and repair parts. Waratah has built a good, reliable head, but it does take a larger machine to handle it. Sure, they break down like everything else, but that's normal for what logging machinery is subjected to. In the long term, we think they'll be better for us." Harve advocates a patient but closely monitored trial period: "All dangle heads are expensive; you've got to stick with them for a while and see how things turn out. A lot of people use stroke delimbers instead of dangle heads, but we think the dangle heads are safer. You don't have the big booms tangling into yarder guylines and interfering with chasers and other equipment. That tail swing can be dangerous." Harve adds that the dangle heads have been popular for a while in Sweden and Finland, mainly for thinning operations, but he finds them completely functional and effective with doug fir that might be up to 26 inches. Processor Gene Morris demonstrates how quickly the Waratah complies with the sort sheet - export logs here and domestic logs over here - delimbed and measured and cut into correct pre-set lengths. Sometimes the base has to be cut (evened off), and these pieces will eventually be hauled to a fiber mill for paper chips. Morris runs the head both up and down a log to get rid of limbs. Harve is pleased with the service he gets from the Waratah Forestry Attachments dealer in Portland. "Sometimes," he says, "they may pull a part off a full machine in the yard to get us going. Down time to us is just plain costly." The Waratah HTH (Hydraulic Tree Harvesters) system currently comes in four models. Noteworthy features include the fact that the Waratah HTH harvesters can be installed without modification to the carrier's standard boom and stick. And three, live feed rollers, one on each drive arm and one fixed in the body of the frame, come together in a triangular configuration to allow maximum traction and correct alignment of the tree. The Waratah Logrite Merchandising Measuring System is a PC based programable software system. It allows the operator to program in minimum and maximum diameter requirements for each programed log length and to select alternate automatic log values if the pro-2001 gramed requirements are not met. Accurate scaled volume (in cubic meters, cunits, or mbf) can be printed on the standard cab mounted printer. At the Carp Head Unit, Harve watches the smoothly run operation. Gayle Slaughter, the yarder engineer, has been with Bighorn for nine years. Jim Kjelland, the loader operator, sorts and loads an average of ten loads a day. The crew is rounded out with hook tender Craig Stone (Jr.), rigging slinger Josue Roman, chaser Steve (Walt) Herb, and choker setters John (Hershal) Mesenbrink and Nicolas Salgado. Harve admits that it is harder and harder to find good choker setters and hook tenders: "You have to be a special sort to like hard work that is dangerous, wet and muddy." The logs are sorted on site at Carp Head, and according to this contract, Willamette does the hauling, even though Bighorn does maintain a fleet of trucks. "I never wanted to own trucks," says Harve, "but I ran across a guy who wanted to drive and maintain trucks. That mushroomed, and now we have ten. It is convenient. I can have them when I need them." The fleet of ten includes eight long loggers that can handle 40-foot stems, a mule train, and a useful self-loader. What makes Bighorn Logging unique? "Quality control," says Harve, "is a big part of our job. We've got to get the greatest value from every tree - through falling and processing and sorting. In the Computer Age, almost every log can be tracked. But I know you can't take a lot of jobs and not deliver the service. I want to be known as someone who does a good job. That's the reward I get for being the president of this company. People can count on us." And the Carp Head Unit shows this: a clean clear cut with streambuffers and ground ready for replanting - a strong endorsement for a responsibly managed renewable resource. Kurt received a Master's in English at Stanford, and taught English and French for 33 years before he became a freelance writer. He has written for a variety of Northwest magazines.